About this object A 10-term Member from Iowa, David Henderson served as chairman of three committees and two terms as Speaker of the House. On this date, David B. Henderson of Iowa became the first individual from a state west of the Mississippi River to be elected Speaker of the House. Born in Old Deer, Scotland, on March 14, 1840, Henderson and his parents immigrated to Illinois in 1846, where they lived for three years before settling in Fayette County, Iowa. In 1861, Henderson interrupted his third-year studies at Upper Iowa University to join the Union Army. After injuries in battle, including the loss of his foot, and eventually his lower leg, he was appointed colonel of the 46th Iowa Infantry in 1864. Henderson’s short colonelcy proved to be one of his greatest political assets during the post-Civil War era when veterans commanded considerable respect and influence. Henderson entered politics in 1865 when, with the assistance of family friend Representative William B. Allison of Iowa, he was appointed collector of internal revenue for the northern Iowa District. After a career in law, Henderson was elected to the House of Representatives in 1882. 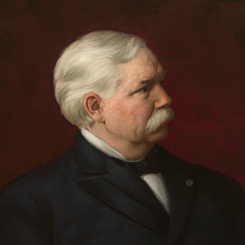 He championed pensions for Civil War veterans, favored high tariffs, and supported railroad safety legislation. A popular congressman, he was known for interrupting his own speeches with patriotic songs. In April 1899, when Speaker Thomas Reed of Maine announced his intention to leave politics, Henderson eagerly put forward his name for the speakership. With nearly 17 years of congressional experience behind him, Henderson won the position, besting his fellow Republicans Albert J. Hopkins of Illinois, Joseph G. Cannon of Illinois, and James Sherman of New York. Henderson was popular at first, and Members even rose to sing “For He’s a Jolly Good Fellow” at the House’s adjournment in July 1900. Yet, following his re-election as Speaker in 1901, Henderson’s old war injuries flared up and he began to grow increasingly concerned over his party’s changing priorities. Henderson announced his retirement from politics on September 16, 1902, after serving 20 years in the House. Amid what one early historian called, "The whisper of scandal,” he completed his term and left Congress in March 1903. Henderson worked briefly in a New York law firm before returning to Dubuque, Iowa, in 1904. By that time, his health had begun to deteriorate. David Henderson died on February 25, 1906, and was buried in Linwood Cemetery.